This past Saturday, I was scheduled to speak at a garden center in southern Indiana, so my wife and I decided to drive south on Friday night and get some birding in on Saturday morning before my presentation. I rarely get the opportunity to bird in this part of the state and was really looking forward to exploring a new area. Our first stop was at Tern Bar Slough in East Mt. Carmel to look for a Hudsonian Godwit that had been sighted there recently. 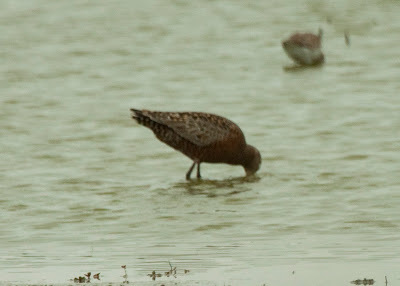 It turns out that the area is much larger than I had expected, and we really had no idea where the bird had been seen. After looking around for over an hour, some local birders arrived and quickly pointed us in the right direction. The godwit was very close to the dike that we were standing on and was in the most beautiful plumage that I have ever seen. Unfortunately, we had to leave for my presentation soon after finding the godwit and were not able to explore the area as much as I would have liked. After the presentation, we had plans to meet up with my brothers in Bloomington and decided to stop at Cutright SRA on Lake Monroe before dinner. Migration is very strong in Bloomington, so I was able to add a bunch of new birds to my year list. Some of the best birds of the afternoon were Orchard Oriole, Nashville Warbler, Prothonotary Warbler, and Warbling Vireo. Unfortunately, our car started leaking coolant and smoking when we arrived in Bloomington. We ended up having to have the car towed to a local repair shop and had to convince my brother to driving us all the way back to Indianapolis. While it was an unexpected complication of the weekend, we were very fortunate that the problem didn't start in the middle of nowhere Indiana. Luckily, our car is now fixed and I can continue on my birding adventures. Next up for me is the Biggest Week in American Birding at Magee Marsh in Ohio. I'm an official blogger for that event and a trip leader, so I hope to see many of you there! Such a great post. I thoroughly enjoyed it, thank you. Congratulations on seeing the Hudsonian Godwit! Sounds like you saw some beautiful birds on Lake Monroe. 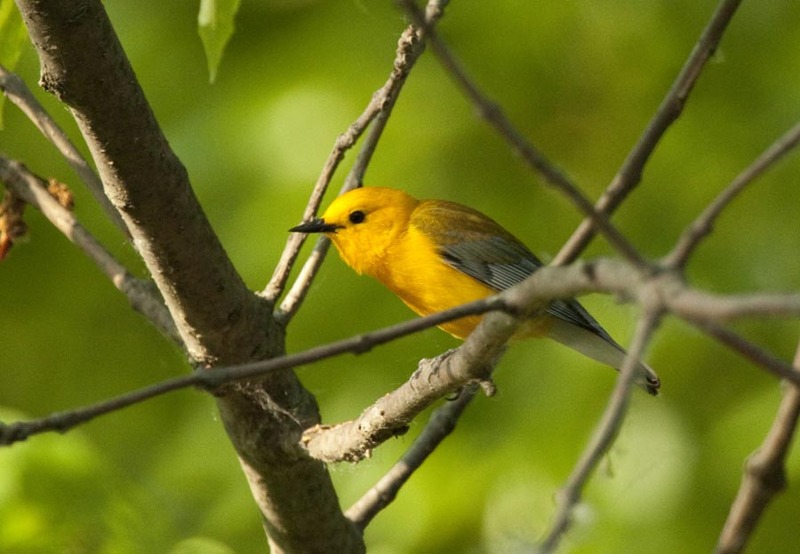 Stunning capture of the Prothontary Warbler. I'm hoping to see a few soon in the Chicago area. Happy birding in Ohio! Sounds like you don't have time to be bored! Happy birding at Magee Marsh then!